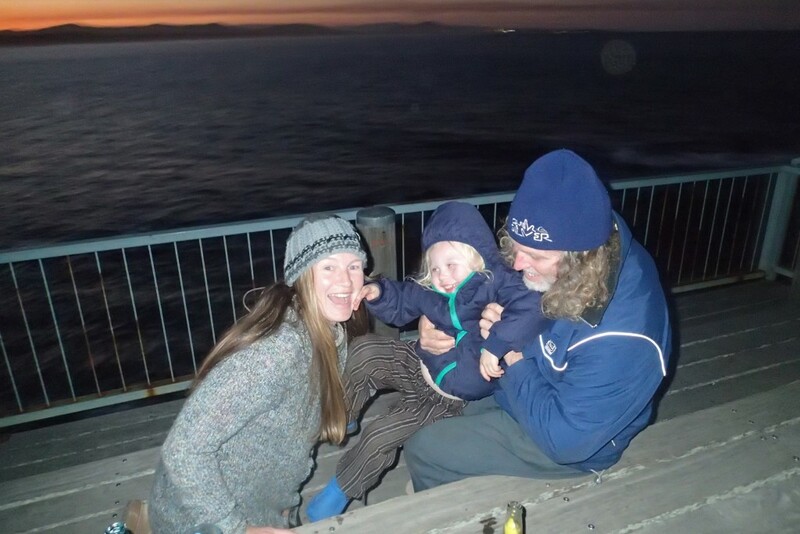 For the last few years we have headed to Scotts Head for a getaway from the cold Victorian winter. Normally we take a day trip to South West Rocks, but this year we decided to have a few nights there on the way home, we were not disappointed with our decision. I promise there are whales in the water, if you look closely you will see the water spouts. 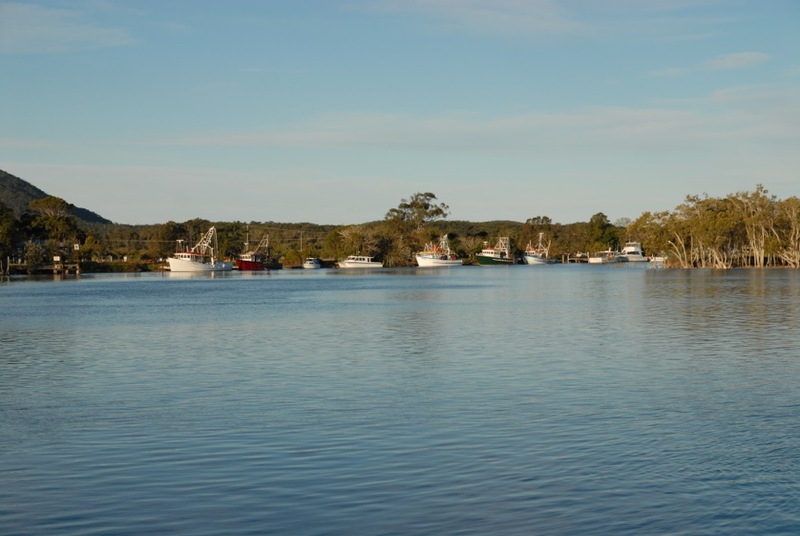 A bigger, busier town then Scotts Head, located next to the mouth of the beautiful Macleay River. 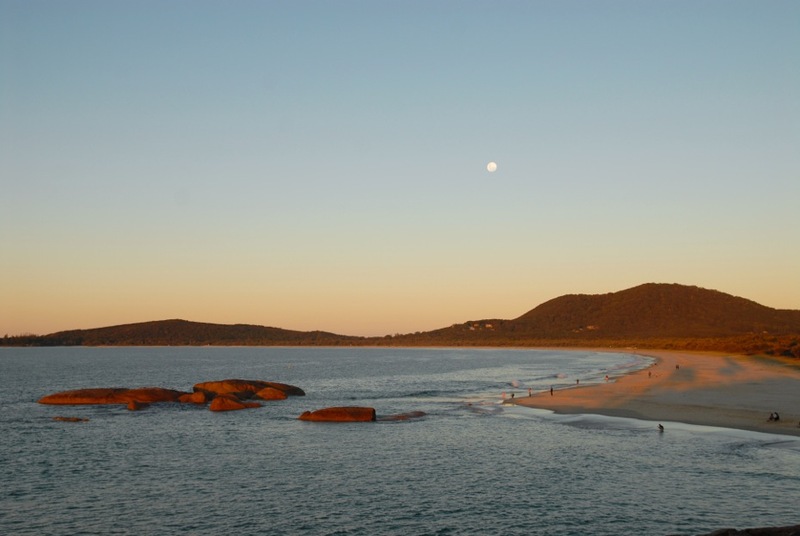 The caravan park is elevated overlooking Horseshoe bay, a perfect place for kids to have a frolic in the surf. There is a great kids park and typical beach kiosk, the surf club overlooking the beach towards Trial Bay has great meals on offer. Back Creek is a great spot for kids to catch their first fish. There is a jetty and a bridge a short walk from the caravan park both are ideal spots to try. Peeled prawn or cut pilchard is the best bait with the likely catch being bream, flathead or whiting. An hour either side of high tide is the best time to try. Thanks to the helpful staff at Rocks Marine Bait & Tackle for the friendly advice. A short drive from the main town center is the Smokey Cape Lighthouse, from here you get a magnificent view back towards Trial Bay and South towards Hat Head. We were fortunate to also see 20 plus whales on their northern migration, a few even coming within a few meters of the bottom Smokey Cape where the lighthouse is situated. I never get tired of seeing these beautiful creatures. I would have happily spent the whole day spotting whales and dolphins except for an impatient 4 year old, who was lucky to spot a big fat goanna happily sunning himself close to the lighthouse. A short drive form the center of South West Rocks is the Trial Bay Gaol. The gaol opened in 1886, after 13 years of construction, in a beautiful setting for a prison. The prison labourers were there to construct a breakwater to make Trial Bay a safe harbour between Sydney and Brisbane. Unfortunately the scheme failed, however you’ll still be able to see the remains of the breakwater from the guard tower lookout. The goal is surround by national park with available camping and a boat ramp, kangaroos are also a common site. 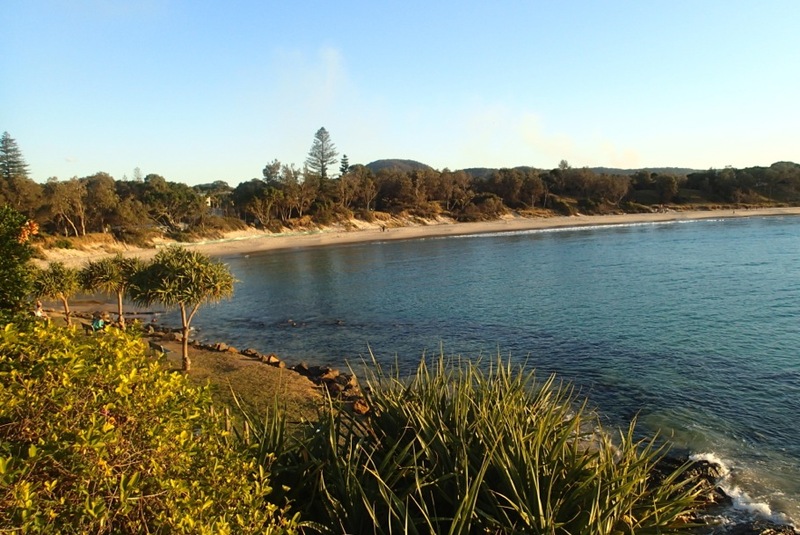 We opted to stay in the campground in South West rocks as the waterfront sites were under maintenance. Tip: It is a popular holiday spot, so if you plan on going in high season I would recommend booking well in advance, the best campsites overlooking Horseshoe Bay are in hot demand even during low season, so also wise to book ahead. When you live in Victoria, I think it is a great idea to head to a warmer climate even if only for a week or three! The last few years we have made the trek to Scotts Head in Northern NSW. 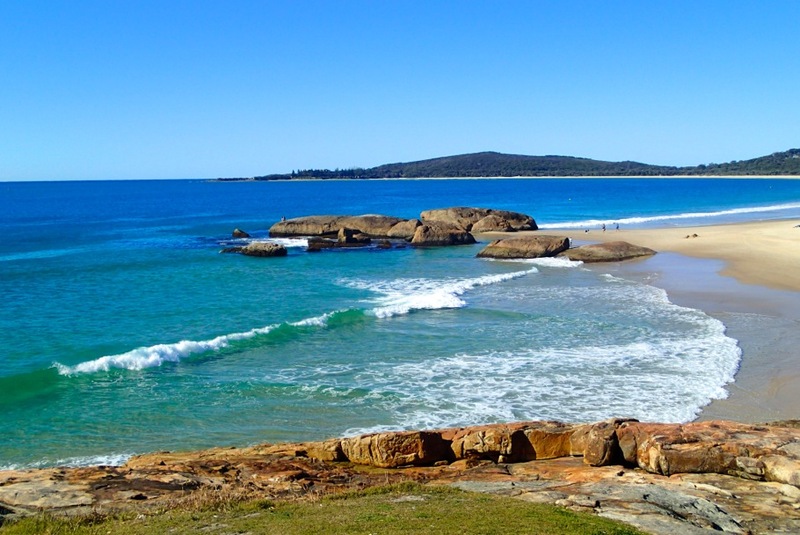 Scotts Head is just south of Coffs Harbour and camping ground is part of the North Coast Holiday Park chain. A group of families we have become associated with have been making the migration north for over 20 years, so why not join them. All of their kids have grown up going there and now young Will is the next generation. For us it is perfect, the most relaxing holiday ever. He spends his time going from one camp to the next, making friends, being watched and choosing the best foods to eat. On the list includes coco pops, fish and chips and cheery cheer, soft drink that seems to be unique to the region. We get to enjoy the beach, generally relax and socialise with a group of people we don’t get to see often. The campground is in the sun pretty much all day, an important consideration when you are heading for warmer weather. Just don’t make the mistake we made, make sure you camp on the side furtherest away form the beach to get most of the sun. It is a very short walk to the beach, only a hop, skip and a jump over the small sand dune. The beach is stunning, a wide expanse of clean white sand. Great for swimming, fishing, stand up paddle boarding and generally chilling while the kids play. As one of the only true point breaks in the region. Scotts Head produces a long right hander and when sanded up, it is regarded as one of the best waves along this bit of coastline. With a permit you can also take your 4wd on a large section of the beach. Although for safety there is a section where vehicles are not permitted. It is a dog friendly camp ground, this year we didn’t take our dogs but opted for a house sitter. The beach north of the site is also dog friendly so you can give your pooch plenty of exercise if needed. Facilities at the campground are clean and well maintained. The toilet shower block has recently been ungraded and is kept spotlessly clean. You even get to enjoy piped music while taking a hot shower. The camp kitchen has a fridge, kettle, microwave,toaster and cooking facilities. Over the winter a gas heater is also available for use, as it does get cool in the evenings. Scotts Head is one of many stunning, small, coastal towns on the NSW coast, it has a neat little coffee shop and the small general store has also been recently upgraded and has some beautiful fresh produce. 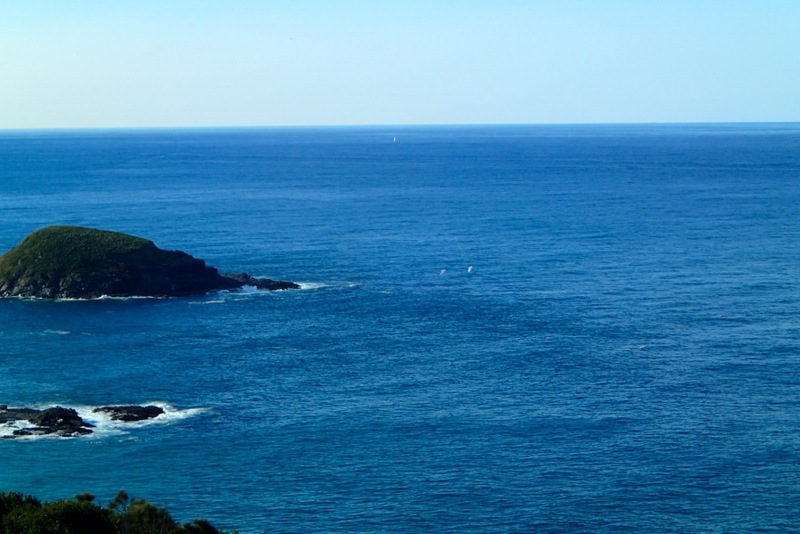 Make sure you head up to the lookout with a glass of champagne and some nibbles to watch the sun sink over the horizon, you may also get to enjoy some dolphins frolicking in the waves just below the lookout. OPEN, Mon – Sat: 7.30am to 4pm, Sun 7.30am to 2pm. Bowraville Country Markets, 8am – 12.30pm, Community Centre. South West Rocks, Horseshoe Bay. Sawtell Community Markets, First Ave.
Bellingen Organic Produce Markets, Showground. Dargo is one of Victoria’s most remote communities, nestled in the foothills of the legendary Dargo High Plains. The tiny town of Dargo, has a small population of only approximately 150, is an entry point for the Alpine National Park, Avon Wilderness Park and Mitchell River National Park. We have some delightful English Workaway girls staying with us at the moment and given the rainy Saturday forecast decided a trip to the somewhat local historic town of Dargo was the order of the day. Dargo is located around 1 and 20 minutes from the township of Barinsdale, which is located a further 3 1/2 hours to Melbourne. The drive is from Bairnsdale picturesque and on easy going sealed roads. About 45 minutes out of Bairnsdale is the Den of Nargun, which is a short drive off the main Dargo Road and well worth the effort to stop by. The name orientates from aboriginal legend. A creature of stone called the ‘Nargun’ that preys on those who stray too close to the Den. The best way to absorb the eerie atmosphere of the Den of Nargun is from a safe distance, it is not recommended to enter the Den itself as it contains fragile stalactites that are still forming and are easily damaged. The Gunai/Kurnai people also ask you to respect this special place by not entering the cave. The main picnic area is located at the Den of Nargun Carpark in the natural surrounds of the park. Toilets, picnic tables, gas barbecue and fire places are provided. The actual walk into the Den is about 5 kms or 1 1/2hours. Make sure to wear comfortable walking shoes, it is not overly strenuous, but does have uneven ground and some steps up and down. Our 3 year has managed the entire walk with out too much effort. Some of the features of the walk are the Bluff Lookout with views of the Mitchell River Gorge, deep green pockets of warm temperate rainforest and Woolshed Creek. As you walk through the rainforest gully, stepping stones lead you into the Den itself. 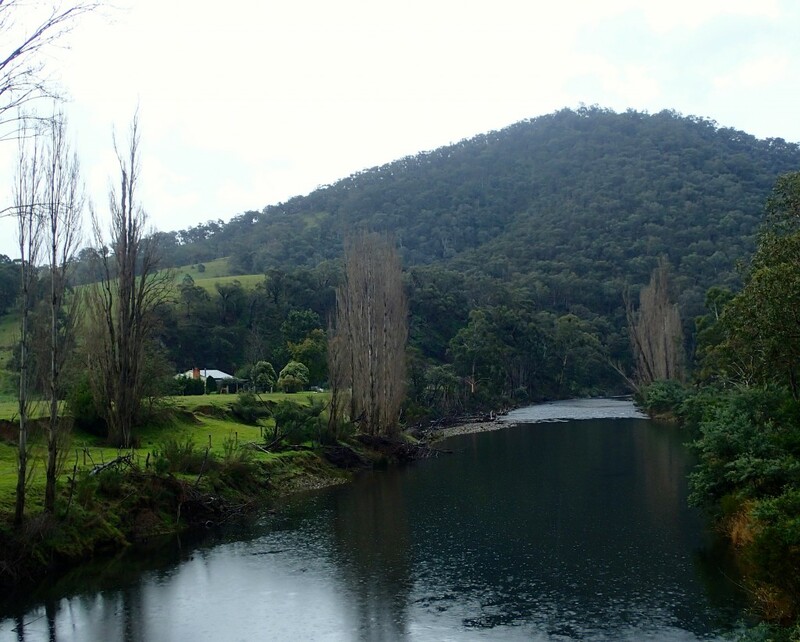 Dargo itself is known for its groves of century-old walnut trees that line the valley floor and today the town is a producer of timber, it is a popular destination for four-wheel drive enthusiasts and bushwalkers as well as trout fisherman. 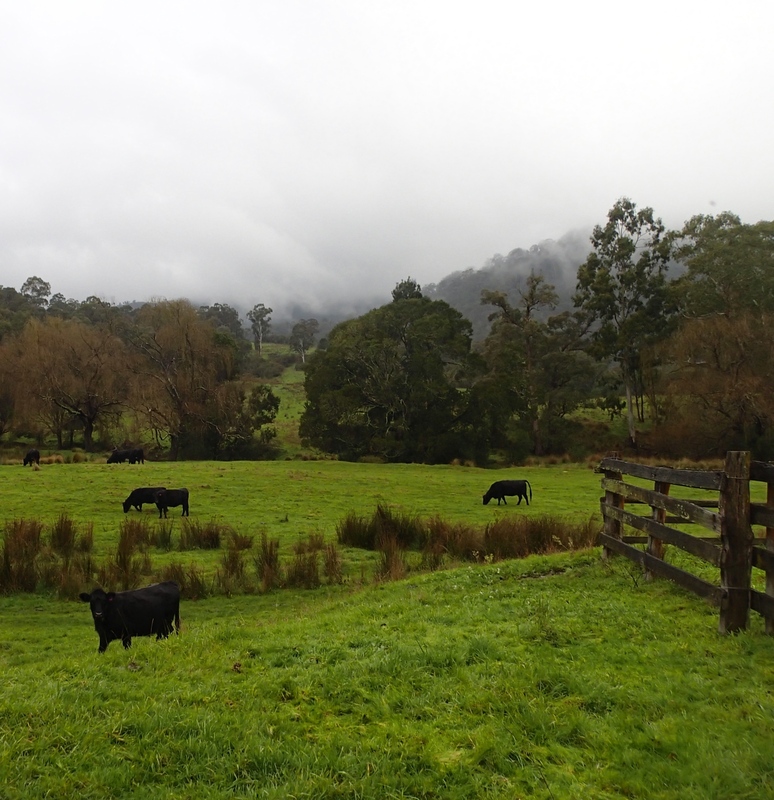 Many of the famous stockman families still remain in the nearby Dargo High Plains. The history of the resides around exploration by Angus McMillan in 1839, on behalf of Lachlan Macalister, who established a run of around 8000 hectares which was managed by McMillan. Farming proved difficult in the mountainous terrain but gold traces were found and, in the early 1860s, a Government prospecting party located gold along the Crooked River. This led to a major rush along the river and further east at Mount Pleasant, the largest mining settlement in the area, which was renamed Grant in 1865. The township then provided a conveient stopover for Victorian Gold Rush miners on their way to the goldfields of Grant, Talbotville, and Crooked River. The Victorian Government has some interesting historical notes on the Drago-Crooked River Goldfields. What can you actually do in Dargo? 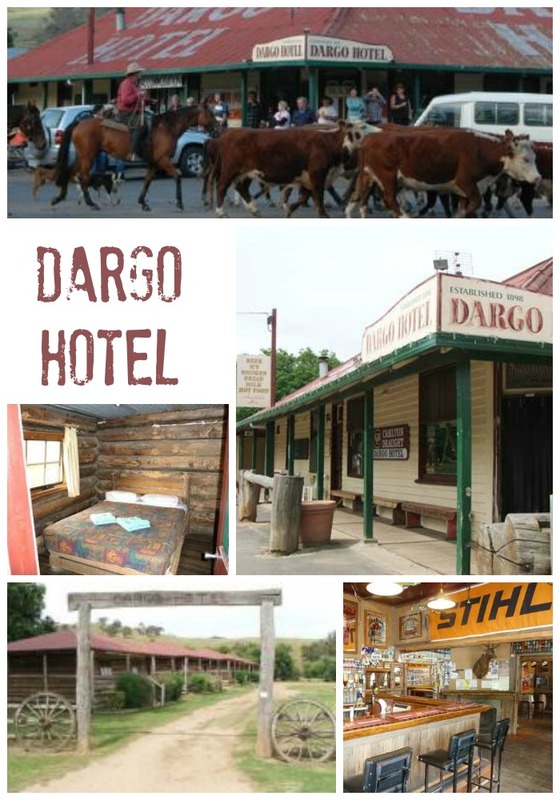 Well to be honest we go for lunch and a quiet beer at the historic Dargo Hotel. We ordered a delicious homemade hamburger with chips for only $12 form the lunch menu – you can’t really go wrong. 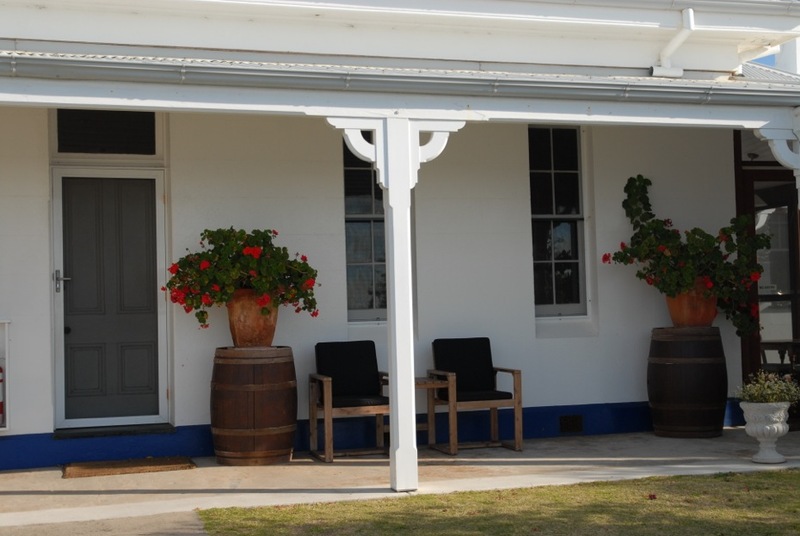 The hotel also has on offer basic log cabin and bunk style accommodation from $50 per person. Trout fishing, using bait and lures or try tickling in Wonnangatta, Wongungarra, Crooked and Dargo Rivers, or in Black Snake, 25 Mile and 30 Mile Creeks. Although It is best to avoid the Dargo river if there have been recent heavy rains as the due to geological nature of the river, it is prone to discolour easily and rise to levels that make shore fishing difficult and wading dangerous. You can also visit Wonnangatta Station by 4WD, once Victoria’s most remote cattle station. Closed from early June to 31st October weather permitting. Enquiries DNRE (03) 5140 1243. The annual Walnut Festival runs through the Australian Easter Holiday period. Include a visit to Myrtle Scott’s Cottage – which include local Folk Art and country crafts, walnuts and fresh local produce. Grab a map and get some local knowledge on what to do and accommodation information. The Pinnacles, may be accessed from Valencia Creek, 2WD vehicle to viewing platform only and Dargo, 4WD access only. Offering spectacular mountain views. After something a little more then visit the Dargo Cemetery, which dates back to the 1860s; a copy of burial records may be read at Myrtle Scotts Cottage. Historic cemeteries are also located at Grant and Talbotville. 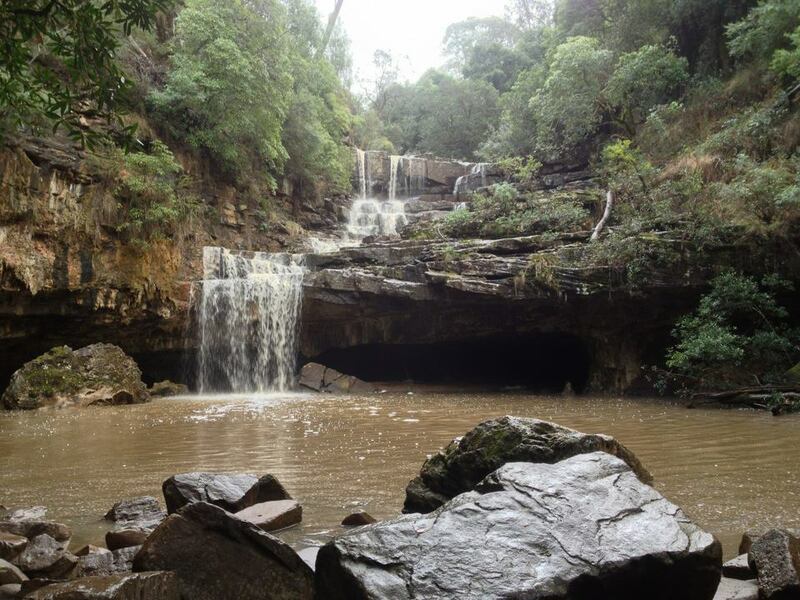 Go gold gold panning & fossicking in the rivers and streams in surrounding hills. You will require a licence. A word of warning, in summer months (December to April) beware of brown snakes that inhabit the area, and become especially aggressive from January to March. This is a non-commercial attempt from http://www.sanctuaryasia.com/ and https://www.facebook.com/sanctuaryasi…, to highlight the fact that world leaders, irresponsible corporates and mindless ‘consumers’ are combining to destroy life on earth. 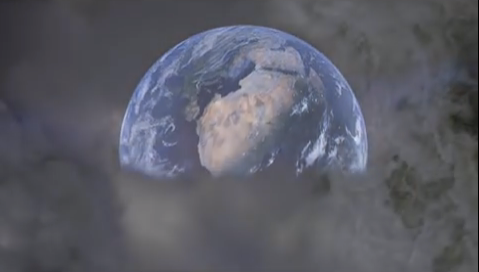 It is dedicated to all who died fighting for the planet and those whose lives are on the line today. The cut was put together by Vivek Chauhan, a young film maker, together with naturalists working with the Sanctuary Asia network (http://www.sanctuaryasia.com/).